Perhaps you’ve seen this new trend out and about recently. Feathers are everywhere! People are wearing them in their hair, on jewelry, just about everywhere you look you can see evidence of this fad. 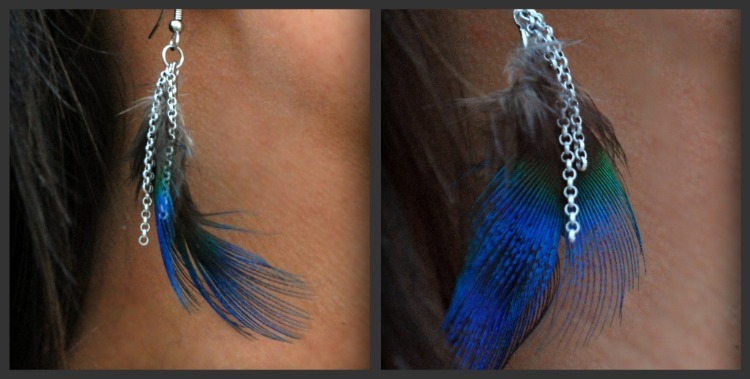 So, when I was brainstorming about the first product I wanted to play around with, I knew feathers were it. 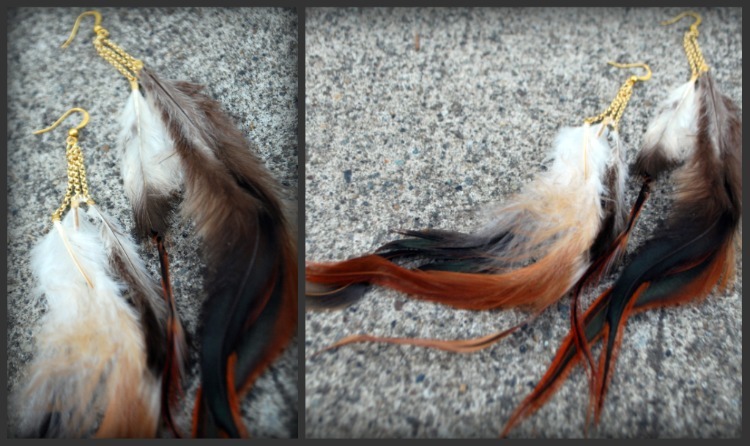 We recently got an amazing selection of feathers in stock and I have been wanting to play around with them. I decided to make a few different styles of earrings and I am pretty happy with what I am up with. This first one is a single peacock feather. 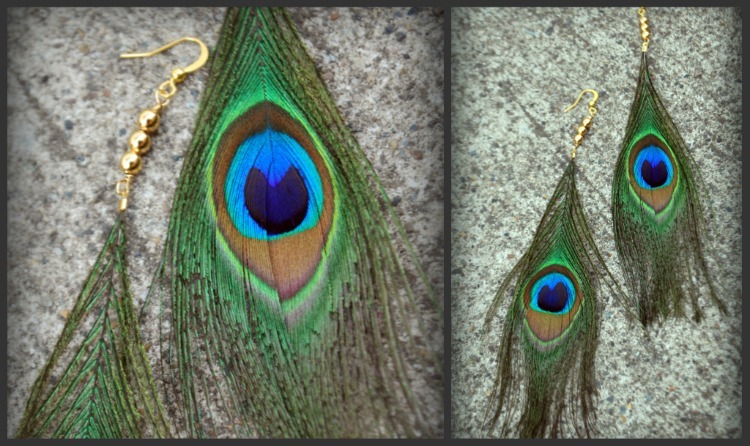 I used a leather crimp to attach the feather and accented it with three 5mm gold rounds. Most of the earrings featured on this post average 6 inches in length. For this pair, I used a bead cup. I inserted a feather into the cup and secured it with a crimp bead. 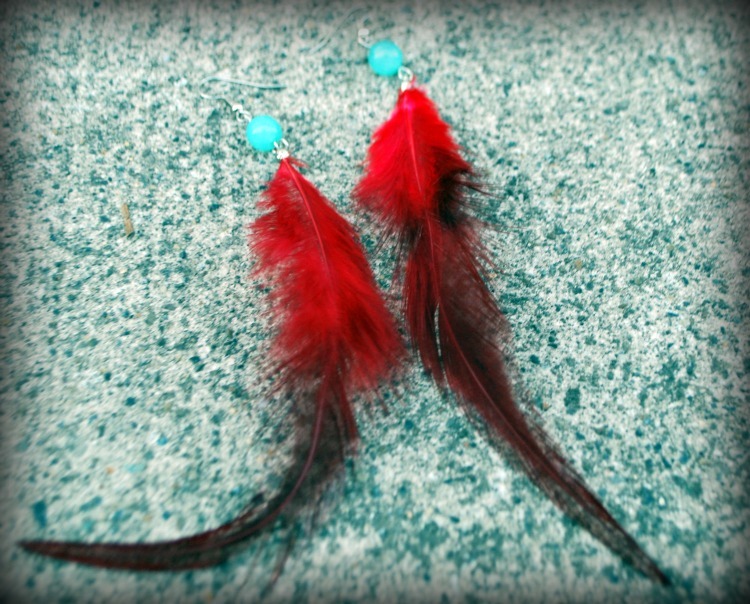 I really love the turquoise and red color combo, so I paired these beautiful ruby feathers with a pair of beads from one of our mixtures. I make a lot of earrings so mixes are an economical way to get a variety of different beads. Here I used two feathers on each earring, attached with a leather crimp, 3 pieces of chain in varying lengths all held together with a jump ring. For this pair, I threaded a couple of round gold beads directly onto the stem of the feather before attaching my leather crimp. I used a small drop of craft glue under the beads to prevent them from slipping. This is the longest pair I created. 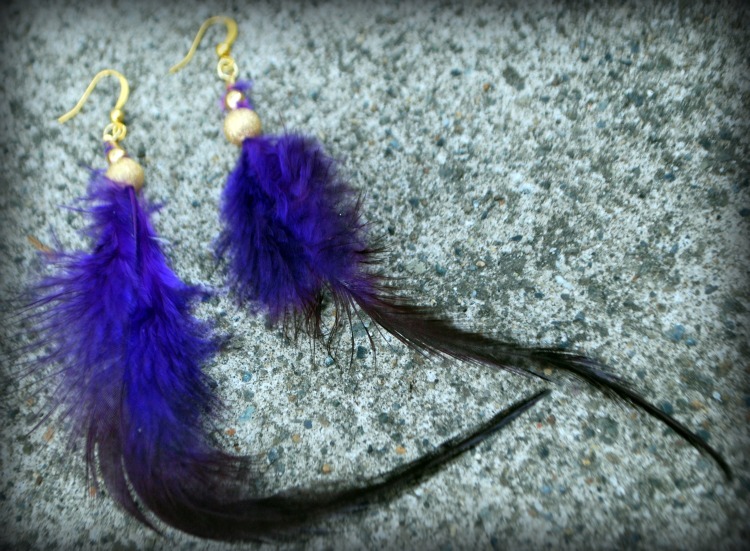 I used three feathers on each earring, attaching each feather to chain with a leather crimp. This is my personal favorite out of all of them. They are really fluffy and I love the color variation in the feathers. I took five feathers and bunched them together. Then, using a 22ga craft wire, I wrapped them securely together. I slipped a silver bead cone onto the wire to hide the wrapping and made a wrapped loop at the top. The feathers were a lot of fun to work with and I had a really good time putting this post together. Please feel free to post any questions you may have in the comments section and if you have any comments, please feel free to share those at well. I really want to make this blog as great as possible and welcome any feedback from you! @ Lisa G – Thats correct. Some cultures believe that it is bad luck to bring peacock feathers indoors because it is said to invite the “evil eye.” I don’t know about that, I just think they are beautiful! In Christianity the Peacock symbolism represents the “all-seeing” church, along with the holiness and sanctity associated with it. Additionally, the Peacock represents resurrection, renewal and immortality within the spiritual teachings of Christianity. Themes of renewal are also linked to alchemical traditions to, as many schools of thought compare the resurrecting phoenix to the modern-day Peacock.